If you can bake a regular loaf of bread, you can make epi. This decorative loaf, traditionally fashioned to mimic a stalk of wheat, is always impressive, providing you don’t show anyone how easy it is to make. 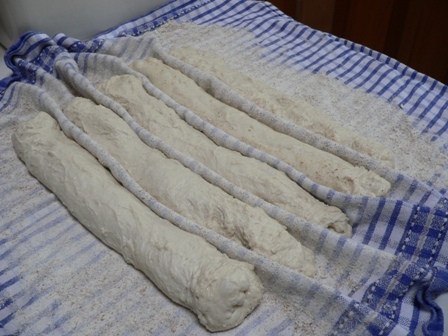 Start with your normal batch of dough (mine was a white sourdough, but it will work equally well with yeasted dough) and when it has finished its first rise, divide it into 250g – 300g portions. 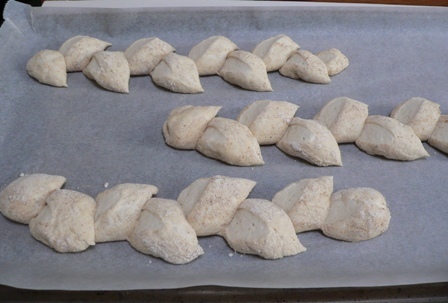 Stretch and roll these out into long baguette shapes and allow them to prove on a floured tea towel until well risen – about 30 minutes for a yeasted dough, perhaps a bit longer for sourdough. I dust my tea towel heavily with rye flour – plain flour seems to stick quite badly. 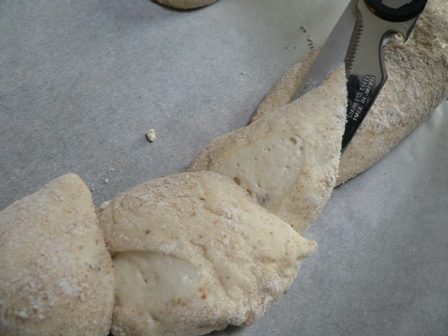 Place the long rolls seam side up, so you can flip them over when you go to bake them. As shown below, pleat the tea towel to form channels for the baguettes to rise in, then fold the ends of the tea towel in to cover the top of the dough while it rises. Preheat the oven to 250C (480F), then drop the temperature down to 220C (430F) – or your usual baking temp – when you put the dough in. Move each proved sausage carefully to a baking tray lined with parchment paper. 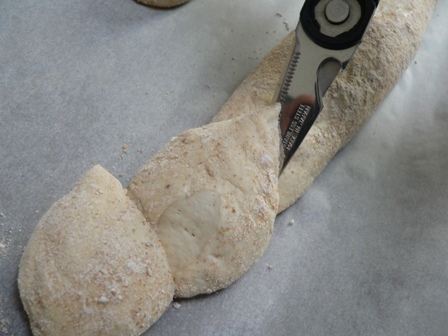 Using a pair of scissors, snip through the dough and twist the little knobs to alternate sides. Once you’ve finished, spritz the top of the epi with water and bake in the oven (dropping the heat down when you put them in) for 20 – 30 mins, or until golden brown and crusty. For my dough, I allow 15 minutes on 220C, then drop the heat to 175C for a further 10-15 minutes, rotating the trays when I reduce the heat. Epi are the perfect bread for sharing – a stick or two on the dinner table can be easily broken up, resulting in lots of little individual bread rolls. It’s also the perfect bread for dipping in the Pukara Novello! Celia you inspire me! I’m up a ladder scraping back our beautiful old home’s ceiling and chatting about sourdough to my son. He’s a keen cook so we are going to make up a starter to have a go, fingers crossed. Suz, thank you! If you can’t make your own starter, you can always buy one – we bought ours from Teresa at Northwest Sourdough, although I’m not sure if she’s still mailing them out. I tried to make one, but only managed to grow mould, but lots of other people have started their own. If you have a look at sourdough.com there is a starter tutorial, and I think there’s one in the e-book on Teresa’s blog as well! Thank you Celia, I had a look at the e-book & looking at your wonderful loaves has inspired me to have a go! I’ll let you know how I go. Thanks for the inspiration.